The G8 or group of 8 world richest nations (<?xml:namespace prefix = st1 ns = "urn:schemas-microsoft-com:office:smarttags" />America, United Kingdom, France, Italy, Germany, Canada, Japan and Russia) at their 2005 summit in Gleneagles pledged to increase financial aid to Africa and other poor countries. 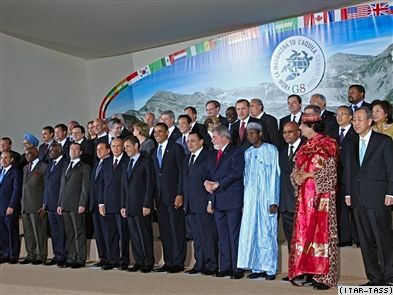 The G8 leaders in 2005 pledged to raise up to $50 billion dollars in aid by 2010. At the just concluded G8 summit (July 7th to July 10th 2009) which took place in L’Aquila Italy, the British Prime Minister Gordon Brown and other G8 leaders called on the group to honour the promise they made in 2005 to help Africa and other poor countries. As their summit ended in Italy, the G8 pledged another $20 billion for efforts to boost food supply to the hungry. Reacting to the above summits as it concerns Africa, I do not think that Africa needs financial aid from the G8 countries. What Africa needs is the reparation of stolen wealth stashed in western banks, economic transparency, true democracy and peace. Therefore the G8 leaders should forget about aid to Africa and work on returning all the stolen wealth to Africa. African leaders have milked the continent dry by looting their treasuries. Many African leaders (past and present) are guilty of this offence. These stolen wealth are taken to Europe, America, Asia and Middle East. Using Nigeria as a case study, “The United Nations (UN) says Nigerian kleptocrats have milked the nation to the tune of about $100 billion dollars thorough various acts of grand corruption, the cost of which it lamented by far exceeded the damage caused by any other single crime”(the Daily Sun, Wednesday, December 3, 2008 page 9). Please note that the Daily Sun mentioned above was published in Nigeria. The figure quoted above by the United Nations is more than the total amount of aid that the G8 promised the entire African countries and other poor countries. Therefore without corruption, Nigeria would have been an economically powerful nation and thus help other African nations. Most of the Nigerian stolen wealth are scattered all over the Western countries especially the Swiss, Liechtenstein, and Luxembourg Banks. The late Nigerian Head of State, General Sani Abacha kept most of his stolen wealth in Swiss Bank. He stole over $3 billion dollars. Till date, all the money has not been recovered. Am sure the Swiss Banks are still accepting corrupt money from most corrupt African leaders. Just recently the Nigerian government traced the Halliburton $150 million dollar bribe money to Zurich. The total amount was $180 million dollars. $30 million dollar is yet to be traced or found. A lot of corrupt Nigerian leaders have used the state money to acquire personal properties in Europe and America. Other corrupt African leaders like, late Mobutu Sese Seku (former president of Democratic Republic of Congo), Charles Taylor (former Liberian President) Ibrahim Babangida (former Nigerian Head of State) etc have most of there stolen wealth all over the world. The G8 countries have a complete dossier or can easily obtain data on all corrupt money and properties of corrupt African leaders. If the G8 is sincere about giving aid to Africa, they should repatriate this money back to the people whose leaders have made poor and miserable. Bob Geldof has done marvellously well to bring the G8 leaders attention to the plight of poor people of Africa. His project of making poverty history will be more meaningful if he can re-strategize his campaign and ask the G8 leaders to return all the stolen wealth in their countries or else where in world back to Africa. The World Bank should also consider stopping financial aid to Africa particularly where there is a proven case of corrupt leadership. In a recent World Bank consultation in London (Wednesday, June 17th 2009), I asked about their criteria for disbursing aids and loans to developing countries. Though that the World Bank might want to help the poor, but in most cases the problems they are trying to solve were caused by corrupt leaders. The World Bank should devise a means of working with other international financial institutions, to make it difficult for corrupt African leaders to keep their looted money any where in the world. Reparation of the already stolen wealth should be on the agenda of the World Bank. This is the best way the can help the poor people of Africa. Africa cannot develop by relying on western aid. Also, Western countries cannot continue giving aid to Africa. The present global economic down turn is a pointer that financial aid from the G8 might not be sustainable. “According to Action Aid, Italy is on course to fall $1.037bn short of its Gleneagles pledge to double financial support to Africa, while France is $1.249bn behind, Germany $497m, the United States $263m, Canada $186m and Japan $138m” (the Independent newspaper, Wednesday, 8th July 2009, page 2). African leaders should learn to develop their economy with minimal foreign reliance. They should look at a fellow third world country like Cuba. Cuba has survived worst economic blockades from the west for over 40 years. Not withstanding the western economic blockages against Cuba, no third world country has approached or even come closer to the Cuban high standards in health and education. At some point, there were more than 15,000 (fifteen thousand) Cuban medical doctors working in over 25 countries of the third world. This should be a model for other countries to copy and not waiting for financial aid. It’s better to teach and tell Africa to be self reliant than giving aids. What the G8 should do for Africa is to stop the flow of small arms to the continent. Angola, Congo DRC, Somali, Eritrea etc are examples of the havocs these small arms have done to Africa. The G8 should consider withdrawing recognition of dictators like Omar al-Bashir of Sudan for his complicities in the Darfur crisis. The G8 should also consider tougher sanctions for countries with poor human rights records, for example Burma, Zimbabwe, etc. Any assistance or partnership should be tied down to transparent democratic process. Finally if for any reason(s) the G8 decides to go ahead with giving financial aid to African countries. Strict conditions have to be met. A country like Liberia should be considered, this is due to their improvement on curtailing corruption. Ghana and Botswana should be considered for being the beacon of democracy in Africa. Nigeria should never be given any assistance or further loans. This is because it ends up in private pockets. Nigeria is sufficiently rich to solve her problems. May God bless Nigeria.